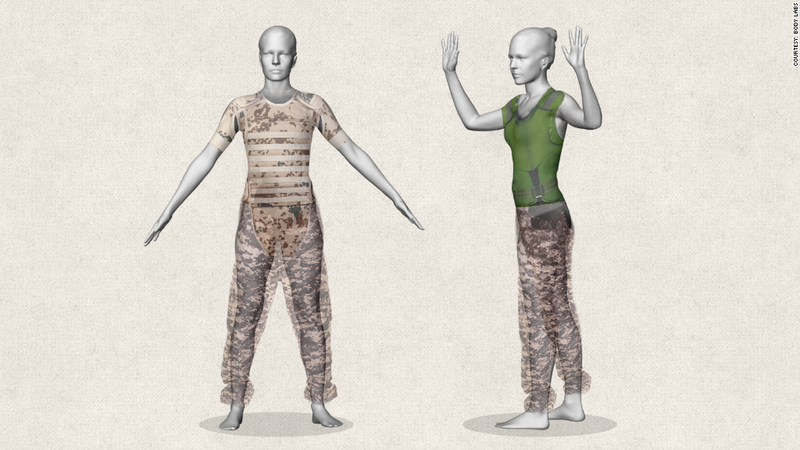 Using 3-D avatars from Body Labs, the Army will design apparel to better fit female soldiers. A partnership with the U.S. Army is no small feat for a startup -- especially when it involves specialty armor for soldiers. But Manhattan startup Body Labs is up to the task. On Monday, the year-old firm unveiled its plans to work with the U.S. Army as part of a two-year, $825,000 contract to create protective gear for female soldiers in combat. "Kevlar vests need to fit really well," said Bill O'Farrell, co-founder and CEO of Body Labs. "You can't custom-make them because it's really expensive. [So] how can the Army manufacture them to fit the maximum [number of female soldiers]?" Body Labs will turn scans of female soldiers into 3-D avatars so the Army can create accurate sizing for women's bodies and virtually test the way the clothes fit. "All [armor] was originally designed to be unisex," said David A. Accetta, public affairs officer for the Army's Natick Soldier Research, Development and Engineering Center (NSRDEC). But according to Accetta, who served in the army for 25 years, the gear more closely fits male torsos. "Females tend to be smaller, their body shapes different," he said. Nearly two years ago, the Pentagon announced plans to fully integrate women into combat roles by 2016. In 2012, the Army first introduced body armor designed for the female body, but Accetta said they're constantly looking for "better ways to protect our soldiers." Enter Body Labs, which provides an unprecedented level of detail and analytics behind human body shapes. Using its algorithms, the 12-person team is able to fill in body crevices (like under the arms) that traditional body scans can't detect. The company's technology was actually developed nearly a decade ago by Brown University professor Michael Black (a co-founder of Body Labs). He and his students developed a mathematical model that could accurately predict the shape of the human body. Essentially, this technology is able to convert laser scans of the body into data points and then create true-to-life 3-D models. In its work with the Army, Body Labs is using data from an 18-month study that compiled 12,000 body, head and foot scans of soldiers -- both men and women. But Body Labs' value also extends to retailers and consumers. On BodyHub.com, anyone can upload scans of their own bodies for free using Microsoft Kinect. Or, you can simply input your measurements and it'll spit out your 3-D version. The company is also partnering with sports apparel firms (though O'Farrell declined to provide names). Plus, it sees potential to capitalize on the made-to-fit clothing trend. And investors are noticing the power of their technology: It received $2.2 million in funding last month from FirstMark Capital and New York Angels. "We are very big believers in mass customization," said O'Farrell. "We think the world is moving in that direction, we envision a world when products, medical equipment, will tailor to us as individuals."